Infectious disease transmission within hospitals contributes to the problem of ‘hospital acquired infection’ (HAI), which can greatly affect patient health and healthcare costs. Pathogenic bacterial contamination and transmission to/from hospital surfaces (such as bedrails, door knobs, privacy curtains) is a very difficult problem to control, as surfaces are often difficult to completely sterilize. We have a number of research projects to study the interaction between bacterial cells and material surfaces, to better understand how to control pathogen transmission. Carbon dioxide adsorption and chemical reduction (to products such as CO or CH4) using sunlight is an important technical challenge that addresses the central problem of global climate change. We are currently part of the ‘Solar Fuels’ project at UofT, to design large area catalytic surfaces for low-cost CO2 photoreactors. We are interested in the design of very high surface area, nanoporous materials to maximize the number of available photocatalysis reactive sites. We have a number of approaches to design hierarchical nanoporous materials through the self-assembly of (removable) polymer templates for complex inorganic structure. 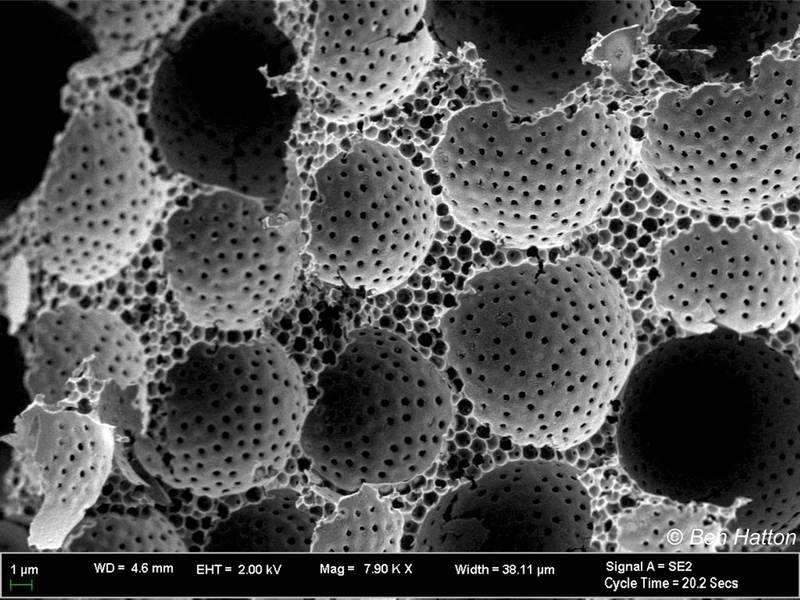 Many plants and organisms have non-wetting surfaces through the design of surface microstructures. Certain non-wetting surfaces, such as the fern (above), or the famous lotus leaf, are known as ‘superhydrophobic’ as they cause water droplets to have very high contact angles and easily roll off the surface. We are interested in using these natural surface properties as an inspiration for synthetic, engineered non-wetting surfaces, which can be used for self-cleaning, water collection, anti-ice properties and controlling surface reactions. ‘Smart’ materials are able to adapt their properties in response to some kind of external stimuli, such as ‘electroactive’ polymers which can change their stiffness with an applied electric field. A number of organisms, from squid and octopus (cephalopods) to certain insects, are capable of rapid colour change as camouflage mechanisms. We are currently developing materials which can mechanically adapt and change their surface properties, such as wetting and bacterial contamination, in response to an applied signal. There is an important need to encapsulate drug molecules efficiently into microparticles, for local drug release. Complex biological nano- and microstructures (such as this pollen grain, above) feature a complex hierarchy across a range of length scales, through self-organization of biomolecules. The field of materials chemistry has developed some novel, bio-inspired synthesis methods that take advantage of self-assembly to efficiently pack drug molecules into small volumes and achieve complex structures at the nano- and microscales.